The Drexelbrook 675 is intrinsically safe and specifically designed for heavy duty service in waste water applications. 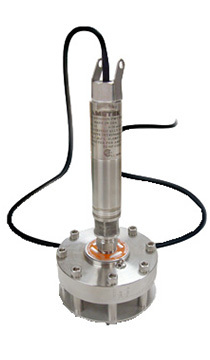 The Drexelbrook Model 675 is a two wire submersible level transmitter specifically designed for slurry and highly viscous applications where clogging of the sensor area is common. To prevent unwanted clogging of the sensing area it uses a 3.5” flush diaphragm. The non-fouling diaphragm and cage assembly are specially designed to eliminate unwanted buildup of debris, fats, oils, greases, and other bio-solids by eliminating any potential gaps on the measurement area. The high integrity seal’s heavy construction eliminates the effects of turbulence on the sensor. The Drexelbrook 675 submersible level transmitter is made of 316SS which offers outstanding environmental protection and is available in depths up to 138 feet of water. It indicates the level of liquid by continuously measuring hydrostatic pressure via its sensing element and sends the data via a 4 to 20 mA output signal. This design provides for excellent reliability in remote and inaccessible locations. The Drexelbrook 675 is approved for intrinsically safe operation in hazardous locations as designated by Class I, Div 1, Groups A, B, C & D and Class II, Groups E, F & G. when used with an approved barrier.